The Visual Arts in our country needs an overhaul in terms of the behavior of state apparatuses (Educational Structures) specific to foster their continuance. Today the war that is being fought at the political level fetters down to the important structures that have been put in place to guarantee the smooth running of the country. The war at play is that of opposing ideals in terms dealing with socio-economic challenges, with education as a point of departure. Cohesion is implied not practice. These attitudes, which are indexical to the opposing political parties in South Africa, erect an iron curtain between systems which should be working together for the country’s development. In institutions and government departments each is concerned only with specific area that they are expert in. Lack of acknowledgement of interrelatedness of our varied structures achieves nothing except a growing cynicism. Should the various systems involved in the same area adopt a more positive role and acknowledge their interrelatedness the results will be tremendous in terms of a positive development of our country. *In the winter of 1999 I had the pleasure of meeting the late Ntate Durant Sihlali(1935 – 2004) at the Pretoria Art Museum. I remember vividly that it was on a Sunday and the art museum had the Leonardo Da Vinci exhibition subtitled: Scientist, Inventor and Artist on show. What was profound about that day was that it was the first time I met Durant Sihlali in person and it happened that on the morning of that day prior to leaving my home in Atteridgeville to attend to my duty as a guide at the art museum, I happened; as I always did those days, to view the regular arts and culture programme that was being aired in the early Sunday mornings by the SABC and it was, I tend to think, by divine coincidence they were showing a documentary on Ntate Durant Sihlali. I remember that he was shown pouring paint on hand made paper. Ntate Durant had played a major role in documenting what was going on during the forced removals of the sixties and seventies in the townships of the Reef. There I was on that Sunday beholding his rather stocky frame perusing Leornado’s anatomical facsimiles in Preiss Hall – one of the Art Museum’s gallery. It was five to six hours later after watching the pre-recorded interview of his. I chanced a greeting and I was delighted when he gave me a friendly reply punctuated by a slow and humbled voice. Such is the delight when an aspiring artist meets an established artists, polarity is established instantly. However my knowledge of Durant Sihlali is rather limited to books for I had only that one brief privilege encounter with him. His contributions to South African art started to flood my mind as time went by for I began to grasp the nature of black South African artists contribution to South African art later in my life. Warren Siebrits Modern Contemporary Art Gallery has mounted a tribute exhibition to him during April this year. However what sharply stands out about Durant when one surveys his oeuvre is his handling of water paint and evolution towards the abstract form. Today this heritage, this ability to delve into the non figurative universe can be discerned in one of Durant Sihlali’s pupils at Funda Centre, Mbongeni Buthelezi, who quite recently I have had the pleasure of meeting at his studio at the Seippel Art Gallery in downtown Johannesburg about ten minutes, through Jozi traffic from the Fordsburg Studios. The studio is pervaded by the burning musk of plastic as he crouches in front of a black and white plastic painting which forms a series, they all burst with white slashes and splashes as if a stone has been thrown into a black solution whose depths are pregnant with a white colour and this colour; when disturbed explodes into various facial expressions and form. Our business in Johannesburg on 31 August 2007 was to introduce Nthabiseng Montshiwa to Ntate Koloane at the Fordsburg Studio. Because of elapsed time due to a burst tire we had to pass by the Seippel Gallery earlier than anticipated for our friend and colleague in the arts the curator of the gallery Mxolisi Xaba had a prearranged call that he was expecting from Europe and had to avail himself at the prescribed time. ‘so you are hard at work man’ says I after we have settled. We are not really seated, the images that surround us are overwhelming, it is actually Nthabiseng who is seating. ‘yes man I am hard at work, you know this is what I enjoy, and with the opening of my solo exhibition coming closer there is no time to waste’ says Mbongeni. ‘Tell me, how did you arrive at this point where you are using plastic’ I ask giving in into the alluring question because when one looks at the work it has a thick impasto of oil painting. ‘When I look at some of the pieces resting on the wall I cannot help but see the quality of water colour painting in them, now I understand that you were trained as a watercolorist; this watercolour quality reminds me of the art of Durant Sihlali.’ I observed. ‘Yes indeed, I was trained by him at FUNDA in the eighties when I use to attend art classes after school and later on when I took art seriously in the late eighties; Durant was a very disciplined and strict artist. I remember I once wanted to reject this medium for the simple drawing technique however Bra Durant enforced the media on us. At the time we had to do some plain air water colour painting so I remember I spent some time painting the old hostels in springs. After prolonged periods of practicing with the media I became better and secured in its use, but as I say I would later find it difficult to afford this medium and that is when I discovered the use of discarded plastic and it was not long when I experimented with molten plastic as a painting media.’ He explains at length. 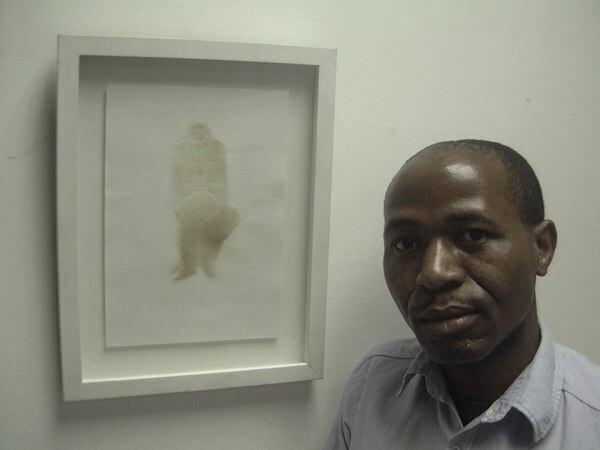 ‘Yes when Nhlanhla Xaba won the standard bank young artist award in 1998 I was invited as an exhibiting guest artist. And my work was exhibited along side his. It was a great exposure for me, I could see then that I was going places with my art.’ He maintains. ‘What do you think of Kay Hassan’s work. ‘Well it is wonderful man, using discarded material always presents an opportunity to re-cycle, to give new life to material. Kay uses discarded Billboard paper – he gives new life to it, I forage for discarded plastic bags – I give them a new use, a new form, a new life.’ He affirms. What one realises when one surveys the artist’s studio, is that the space is in par with what Mbongeni has just remarked. He does indeed recast a new life into plastic…and this is the ideal of the artist’s relation to new media – to breathe new life into it. 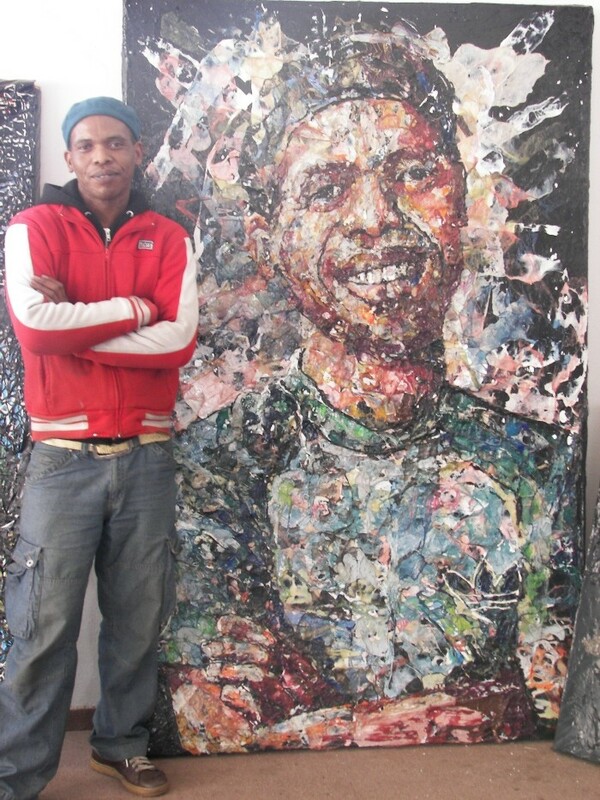 Mbongeni Richman Buthelezi’s plastic paintings are on show at the Pretoria Art Museum from 13 May – 16 August 2009. *this piece was written in mid 2008 prior to the opening of the exhibition officially in May 2009.